Keep Moving Movement: Dada Vaswani's question and the old man . 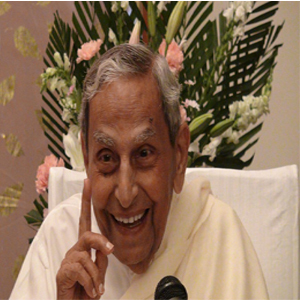 Dada Vaswani's question and the old man . The martial arts expert Terry Dobson was travelling on the Tokyo subway. A drunk boarded the train and started insulting the passengers. With the ego of being a martial art expert, Terry challenged the drunk. Terry got ready to subdue him and save fellow passengers from being disrespected. An old man, sitting two rows behind, shouted, "Hey". The drunk turned towards the old man and threateningly remarked, "I will first beat the foreigner (Terry) and then beat you up." "I like to drink too" said the old man. "Every evening, I sit with my wife and we drink sake. Are you married?" The drunk looked confused. He dropped his aggressive demeanor and in a low voice, replied, "I have no wife. I have no family. I am so alone." The old man asked the drunk to sit beside him. By the time Terry Dobson got off the train, the drunk was in tears. So was Terry. When I read this story, I was completely moved. I realized, all some people need is a friend. "Did you see him on the road? Did you still leave him with the load?" Right now, I am wondering, do I have the heart and the presence of the old man on the train? I am wondering, will I answer a resounding YES to Dada Vaswani? The old man in the train certainly would!! !